CLNA began operations in 1989, leasing a 17-mile line from the current Norfolk Southern Railway. This route serves the stations of Pinetown, Acre, Terra Ceia, Bishops Crossing, Pantego, and Belhaven in eastern North Carolina. In 2007, CLNA became much larger. It leased a 142-mile part of the original Norfolk Southern mail line from near Plymouth, NC to Raleigh. It intersects with the CLNA Belhaven Branch at Pinetown. Major stations along this route include Plymouth, Pinetown, Washington, Chocowinity, Greenville, Farmville, Walstonburg, Stantonsburg, Wilson, Sims, Bailey, Middlesex, Zebulon, Wendell, Knightdale, and Raleigh. Interchange is made at the Norfolk Southern Chocowinity Yard, as well as at the NS Glenwood Yard in Raleigh. Connections with CSXT are available at Greenville and Wilson. In 2010, CLNA began serving the Port of Morehead City on a 1-mile spur between Morehead City and Radio Island. Connections with Norfolk Southern are made at Morehead City. The line between Belhaven and Bishops Crossing was built in 1887 by Roper Lumber as part of the Albemarle & Pantego Railroad's line to Mackeys, NC, where a ferry operation provided connections to Norfolk, VA. In 1891, the A&P became part of the original Norfolk & Southern, which at that time operated a through route from Norfolk to Belhaven. In 1889, the Washington & Plymouth Railroad was built between those two cities as a 3-foot gauge line by Roanoke lumber. The W&P was converted to standard gauge and merged into Norfolk & Southern in 1904. A connection was built between Mackeys and Plymouth to connect the A&P and W&P lines. The line from Pinetown to Bishops Crossing was built by Norfolk Southern as a "shortcut" to Belhaven in 1907. The Raleigh & Pamlico Sound Railroad, organized as the Raleigh & Eastern North Carolina Railroad in 1903, had built lines from Raleigh to Zebulon and from Washington to Chocowinity and Bridgeton by 1906, when it was merged into Norfolk & Southern. Norfolk & Southern became Norfolk Southern Railroad in 1910 and completed the line between Zebulon and Chocowinity. The original Norfolk Southern eventually operated a through route from Norfolk to Charlotte until 1974, when it became part of Southern Railway, which was then merged into the new Norfolk Southern in 1981. CLNA was created in 1989 as part of the "Thoroughbred Shortline Program" and was a subsidiary of Rail Link, Inc., which became a subsidiary of GWI, Inc. in 1995. Current management acquired the line in 2003. Rail service to Morehead City began in 1858 with the completion of the Atlantic & North Carolina Railroad from Goldsboro, with the state being the majority owner. This line was leased by the original Norfolk Southern in 1904, but in 1937 it dropped its lease between Morehead City and Beaufort. The Beaufort & Morehead Railroad operated that segment until 1990, when it was acquired by the North Carolina Railroad Commission. B&M continued its operation until the late 1990's, when the bridge to Beaufort was abandoned. Switching services at the port were maintained by Carolina Rail Services until 2005, when it was leased to Morehead & South Fork Railway. CLNA assumed the lease in 2010. The line from Rocky Mount to Spring Hope was originally built by the Wilmington & Weldon in 1887. It became part of the Atlantic Coast Line in 1900 and the Seaboard Coast Line in 1967. 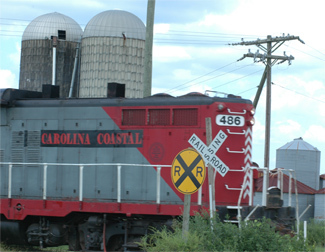 Nash County Railway was formed in 1985 by its parent, Laurinburg & Southern and was taken over by Gulf & Ohio in 1994. CLNA purchased the line in 2011. A portion of the line from Momeyer to Spring Hope has been owned since 2006 by NCDOT.